…Or the first step into another world. Here I will tell you about the pathway to my new life. As you can imagine, such an open-length journey is extremely exciting. What do you take with you? What can you leave out? What at all is existing in a country, where there has been more than 20 years of civil war? These are just a few of the innumerable questions that were buzzing around in my head. However, I was full of confidence that everything will work out somehow. Because in Islam, trust in Allah is very important. You do and plan what you can, but then you trust in Allah and see, if His plans are the same as yours. He is still the best planner and one thing I learned after a few years in Africa: it always comes different than you think! This attitude to life helps you a lot to stay calm and not to unnecessarily go crazy (okay, honestly, I’m still working on it :-D). We, my husband, my co-wife with her 2 toddlers and myself, started the trip at the end of May 2010. This is the time when the schoolchildren in Somalia have about 3 months of heat-free holidays. We flew directly from Denmark to Dubai. At the exit the indescribable heat almost killed us. In summer the heat in Dubai reaches 50 degrees. Accordingly, life takes place after sunset. You do not even have to move- the sweat drips on its own! On the other hand, in shops, cars, hotels, and probably houses, there are exaggeratedly cool air conditioners that will make you freeze. If you want to travel to Somalia, booking a complete flight is not so easy, at least not through one of these online-booking-systems. 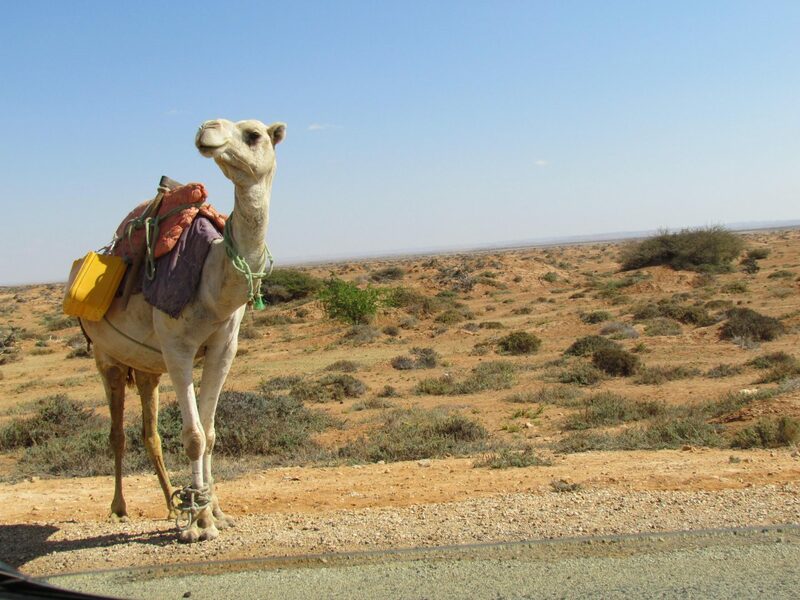 Everyone has to take a break in either Kenia, Ethopia, Turkey or Dubai and wait for the next best flight to Somalia. We were allowed to spend about a week in Dubai. This break turned out to be the first test for me: I was plagued by terrible diarrhea! So it’s best not to eat fast food from outside, better from the hotel! Or just eat vegetarian on the first trip! In Dubai, however, there is enough medicine, so that I was better in time for the onward flight (alhamduliLlah). In Dubai you experience the total opposite to what awaits you in Somalia: the whole world is gathered. The whole worldly goods are flooding. It only can be described as superlatives (most beautiful and modern,highest, etc.). But our goal was the exact opposite. Life in Somalia is relatively tough. Poverty still prevails or is definitely obvious. Besides, the „natural“ streets and not even one-story houses (mostly) offer you a rather simple life. But it is exactly this rather simple life, which brings you back to reality, to the reality of life. It even brings you much closer to the meaning of life: that we are Allah’s servants and should serve Him (by worshiping Him alone, by good deeds, etc.). That’s why I Prefer the life in Somalia than life abounds. I do not remember exactly where we stopped off. I think it was in Berbera (Somaliland). However, I still remember very well the onward flight to Bosasso (Puntland). That was the worst flight of my life so far! This flying part of an airplane was definitely a sorted out piece from Russia! It was obvious by the poor equipment inside: no ventilation system and no emergency exit! So we were almost melting until we started the flight and freezing short after in the blue sky! The aisle was so crammed full of travel bags (down to belly height) that even the captain and his crew struggled to get to the cockpit! I asked my husband: „How can we find the Exit in case of emergency?“ My husband who was struggling to calm down the kids, answered very calm and relaxed: „Sweetheart, there is NO EXIT in this plane!“ He looked somehow amused about the whole situation, while I was not believing what I see! I was also told that the (Russian) flight crew regularly „smells“ of alcohol. But I could not confirm that, thanks to God. Anyway, it was like a horror-movie which became reality! But in the end, I was so knocked out that I put my head to the metal- wall in front of me (sitting in the front) and tried to get vanished trough the sleep. It looked similar to this one, just more worse! Thank God we arrived safely in Bosasso and I never saw this plane again- and I’m not missing it! Now it was time for my first steps on the Somali soil, alhamduliLlah. Bosasso is a city at the Red Sea, so actually a nice start! Somehow everything looks a bit surreal: on one hand, fairly high, barren mountains, which are almost threatening, and on the other hand, the beautiful, turquoise-colored sea. In addition, the heavy wind almost blows off your clothes. The heat there (in the summer above 40 degrees) is not much different than in Dubai, but the fresh hot breeze makes it bearable, at least in the Evening. We were directly picked up by my brother in law and had been brought to Hotel Jubba. On the way to there you get first an impression of poverty in Somalia, a bitter aftertaste of the long civil war. Because between the airport and the city are the poorest of the poor settled. Not long after those you can see even multi-stores, white and beautiful houses, which are provided with the typical round arches. These are mostly hotels and shops. You really have a lot to wonder when you arrive in Somalia for the first time! Everywhere people and goats mingled, who are unstoppable by the cars, unless they activate their horns. Before or between the large shops, whose walls are always very colorfully painted with the contents (for example, sugar, flour, or cell phones, etc. ), are often small self-built mini-Shops. Unfortunately, in front of these mini-Shops you can see everywhere Khat being sold. These are some kind of leaves which operate like a drug and make you very careless about everything. Sadly it is the most common drug for soldiers and lorry drivers. Mostly they are sold by women who are struggling for survival. What´s also very obvious: Women and girls wear very colorful hijabs (as opposed to the prevalent black in Dubai). Together with the colorful painted stores, it gives a very impressive and positive picture. Beside this interesting view, the sand is whirled by the cars and the wind, which gives a dusty view under the deep blue sky. My first night on Somali ground was, beside the tiredness, still a kind of exciting, even though I was far too exhausted to deeply ponder about it: I was actually scared that the fan would fall on my bed! Because it always swayed so much back and forth … but thank God, nothing happened 😉 Beside all, in my Hotel room was everything else you need, even sturdy wooden furniture. The road between Bosasso and Qardho- adventure for itself! Since in Bosasso the summer months (late May to late September) are too hot to endure without air conditioning, most families go for this school-free time to the nearest villages or cities. Only the business men and the poor who can not afford to move, stay in Bosasso (and some hard-boiled families). One of these relatively nearby small towns is called Qardho. My mother-in-law and part of her children and grandchildren had settled there for the holiday season. So we did not want to waste our time in the heat and drove further to Qardho the next day with the Landcruiser of my husband. It is an impressive drive of about 4 hours. The street is still left over from the Italians in the 80’s and surprisingly well preserved. Only a bit tight, in the oncoming traffic.This road is the main road, which is the gateway through Somalia. Sometimes you have to leave the bumpy road to get through it on a country-side-way, but mostly it is good enough to drive on it. On the way from Bosasso to Qardho you pass many mountains that really do not carry any herbs and therefore look so unreal; you pass as well on dry riverbeds that suddenly produce beautiful tall trees; as well as the semi-steppe, which has room for many camels and other grazing animals due to its dry, almost silver bushes. Not to forget the frequent roadblocks where soldiers stop you with a taut rope or another object to earn a few cents for the next meal. Sometimes you come across a village that consists of a few simple houses or self-made huts, in which no mosque may be missing. I love this route until today. At that time, while it was my first time seeing so many soldiers with weapons, my heart throbbed pretty well. I prayed at every roadblock and tried to avoid the glare of the soldiers. My husband had been given a gun license because of me (like my bodyguard), but these sparsely paid, often khat-chewing soldiers are sometimes unpredictable. But thank God everything went well and we arrived safely in Qardho. It was lunchtime when we honked in our jeep in front of our new home and were then greeted by sooo many children. I suddenly realized that I can not speak the Somali language at all. In order not to let it be too long, I conclude here once. In the next article I will tell you about my first attempts to integrate in Qardho and Bosasso. One thing is for sure: anyone who embarks on a trip to Somalia should definitely bring with him a good deal of trust in God (taqwah) and, most of all, vitamin B (good relations in case of need). To be continued and looking forward to your comments, likes and stuff like that (in shaa Allah)!